in my last outfit post i sported these shorts to be playful by pairing it with a chambray shirt & espadrilles. this time around i paired it with a cropped sweater, mules and oversized sunglasses for a more retro look. i love having a piece in my closet that is versatile enough to create multiple styles. basics are easy to play with, but there are pieces that aren't so obviously versatile. so when i can make a non-basic in my closet versatile it makes me feel like i'm getting more than what i paid for! 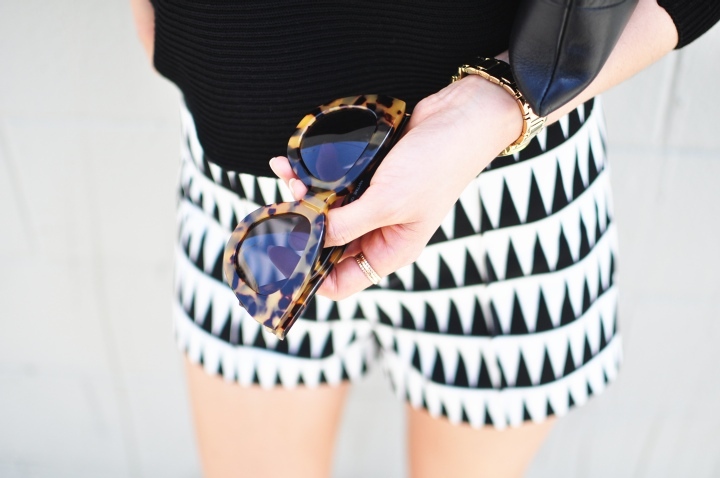 these geometric print shorts did just that! thanks jamie! i'm not huge on prints, but i'd have to say that i do LOVE these shorts!